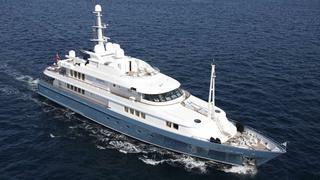 Here's a notable entrant to the market as David Frazer at Yacht Xchange offers the 52m motor yacht Sea Jewel for sale. At the time of her build in 1997, she was the largest yacht from the German superyacht builder Abeking & Rasmussen and was designed by the famed Espen Oeino. A voluminous interior by Luigi Sturchio accommodates 14 guests in seven en suite staterooms along with up to 16 crew in seven cabins. She was refitted in 2002 and has been regularly updated since, including the installation of at anchor stabilisers in 2008. Twin 1,900hp Caterpillar engines give her a cruising speed of 15 knots, a maximum speed of 16 knots and a range of 3,500 nautical miles. Her engines have been constantly maintained by Caterpillar at all times and new generator blocks were fitted in 2011.